Two years ago, French archaeologist Jean Yves Empereur and his team discovered the Pharos lighthouse, one of the Seven Wonders of the Ancient World. The fabled lighthouse was underwater, just offshore from the modern city of Alexandria in Egypt. 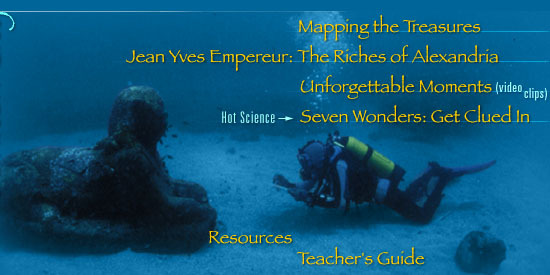 Find out what high-tech tools Empereur uses to map these ancient monuments, explore a piece of the map yourself, and learn what other treasures have since been discovered. Many thanks to Gedeon, France for the use of photographic images throughout this web site.